This NY Times Bestselling Book and Multi-Award Winning Activity Kit is an educational tool with a thousand uses. These bright colorful scarves stimulate the senses, encourage movement and teach and reinforce color recognition. Parents can use this book to encourage imagination and solo and choral reading. Dance to the music or use for dress up. These scarves are an open-ended tool, limited only by the users imagination. Launch date: June 2011. 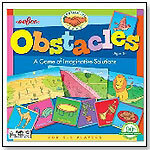 Obstacles - A Game of Imaginative Solutions by eeBoo corp.
Obstacles is a journey along a path of hazards and barriers which are overcome by the collective cleverness of its players. Armed with an unlikely set of tools, imagination, and some silliness, players "cooperate" creatively to innovate solutions that let them get home together. "Obstacles is eeBoo's first "cooperative" game. It teaches the useful skill of creative collaboration and makes for a play experience that is positive and constructive as it promotes good feelings amongst players. It is a perfect game for parents, children, and siblings to be silly and imaginative together," Regina Gelin, sales and marketing associate at eeBoo, told TDmonthly. Launch date: July 2011. A fun way to discover 100 everyday sounds. Children will be delighted to hear sounds that come to life when bar codes are scanned by using the Smart Pen. Crystal clear technology teaches animals, musical instruments, vehicles, machinery and nature sounds. The sounds are recorded in high fidelity and are very realistic. 50 double sided learning cards are included for hours of learning fun. Launch date: July 2011. Zafari is a puzzle game that teaches the alphabet and animal names in English & Spanish. 27 Brightly colored puzzle cards have unique die-cut openings to help children complete the puzzle and identify beginning sounds in English & Spanish. On the other side of the card, it has a realistic photo of the animal and its name in English/Spanish. Sturdy puzzle cards are self correcting and easy for a child to play with. Launch date: July 2011. Awards: 2011 Creative Child Puzzle of the Year. Flashwordz by U.S. GAMES SYSTEMS, INC. This exciting new word game requires a quick hand and a keen eye. Players create words by combining letters from their own racks with letters from another player's rack. With double-sided letter cards, everything can change in a flash. When the timer goes off it becomes a free-for-all FlashRound. Game includes 100 two-sided letter cards, 4 card racks, FlashWordz Timer, and FlashRound Token. Launch date: July 2011. Awards: 2011 Creative Child Preferred Choice Award. Lil' Cutesies are play dolls that are dressed in the cutest outfits. Cutesies encourage creative play. Each doll is sold separately, or they can be purchased in sets of three. Launch date: January 2011. Teach My Preschooler by TEACH MY TODDLER INC.
With Teach My Preschooler, little ones can get Ready To Read, Print, Count to 100, Add & Subtract, all in one kit. Teach My Preschooler is the multi award winning, all-in-one learning system for preschoolers. The kit has all the educational tools necessary to help prepare preschoolers for kindergarten. The kit is divided into four sections – Ready to Read, Ready to Print, Ready for 1-100, and Ready for Math – each fully-coordinated with books, flashcards, posters, a print guide and magic drawing board. Developed with education consultant Judith Rowlands, M Ed., Teach My Preschooler is designed to give preschoolers a head start, develop fine motor skills, encourage parent/child interaction and increase school readiness skills. Launch date: September 2010. This 51 piece set helps kids get back to the basics. With the addition of square locking widgets this simple block set turns into a building set with ability to build stable horizontal and vertical structures as well as endless stacking fun. Launch date: 2010. The SqwishLand Soft `n Squishy Bracelet is a fun new way to bring a child's SqwishLand collection on-the-go. Kids customize the bracelet with their favorite SqwishLanders, and can swap out different animals depending on their mood or outfit. The bracelets are also soft `n Squishy™ and come in four cool colors. Comes with one SqwishLander on the bracelet, as well as a Crazy Rare SqwishLander in a capsule. Launch date: Summer 2011. Viewing products 341—350 out of 1181 products.